Chapter 6 The Katoomba and Gladstone Collieries. This chapter follows the History of both the Katoomba and Gladstone Collieries culminating in the installation of the Bleichert Ropeway to the Ruined Castle Oil Shale Mine. This is an article from the Newcastle Morning Herald 13th October 1886, research contributed by John Shoebridge. We feel that this article is not a true “first person” account but has been re-written, as some of the facts do not match with our current ideas. The haulage that is described in the last paragraph wasn’t installed until AKO&M took over in 1890. 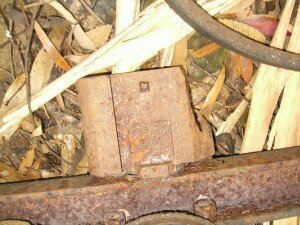 An email from Ray Christenson of State Mine Heritage Museum Lithgow….. I am in the final stages of preparing my book on Tyldesley Colliery and today I came across a reference in the trade magazine Australian Coal, Shipping and THE HARBOUR of May 1958 indicating that the mine “was formerly controlled by J. North a Sydney stockbroker who sold it about 36 years ago”. The mine changed ownership in 1917, the year of J.B. North’s death. The offices of the mine’s original owners, Great Western Mining Co. Ltd. and Australian Coal Supply Company, were located at the Royal Exchange Building, Pitt Street Sydney. The owner of the mine from 1915 to 1917 was Invicta Coal Company. This company was located at Vickery Chambers, 76 Pitt Street, Sydney. Do you know if any of these names or addresses have come up in your research of John Britty North and his successors? This J.B. North & Son Logo was found in the State Archive on a letterhead. This logo was found on a document inthe State Archives. I surmise this configuration, even though I admit that it is unlikely, but because of the complete absence of rope marks on the edge of the foundation pit for the winder. If it had been a under and over winder, on a dual drum, there must have been times where slack rope dragged on the timber on the underfed side of the drum. This timber was still in place when we excavated the pit, and there wasn’t a mark on it. The configuration of the pit is most unusual, suggesting a single central mounted horizontal cylinder, but this would make a reversing winder quite impractical, so maybe it had twin cylinders, one horizontal and one vertical????? What happened to J B North’s sample of Katoomba coal displayed at the Sydney International Exhibition of 1879 ? During the research work for The Burning Mists of Time I was intrigued by the question as to what happened to the very large block of Katoomba coal that J.B.North had laboriously dragged up the cliff line and railed to Sydney for display at the International Exhibition. Did it go up in flames, together with the Rev Clarke’s copious papers and mineral collection, when the building burned down two years after the exhibition closed? NORTH, J. B. 105 Pitt Street, Sydney. Coal from Katoomba Colliery, Seam 4’ 3” in thickness. Also Kerosene Shale from Katoomba. I was amazed, because I could not imagine how there could have been a connection between the Colony of New South Wales and an exhibition in Calcutta. So I did some more research. It turns out that the late 19th century saw a proliferation of fairs and exhibitions across the world. This was the means of communicating the products and progress of nations, and thereby encouraging trade. The process was started by The Great Exhibition in London (Crystal Palace) in 1851, moved on to Paris in 1867, Vienna in 1873, Philadelphia in 1876, Paris again in 1878, and then Sydney in 1879. One of the key players in the Sydney exhibition was the French-born Mr Jules Joubert who became secretary of the Agricultural Society of NSW in 1868. He had taken a leading role on organizing the annual NSW shows. His brother had been French consul in Sydney many year, and Jules was one of the commissioners for NSW at the Paris exhibition in 1878. He took along 12,000 pounds sterling, raised in NSW as aid for victims of floods in Provance. He was made Chevalier of the Legion of Honour, and returned to Sydney with a promise from the French government that they would send to Sydney some of the exhibits that had so impressed visitors to the Paris exhibition. The 1882 Exhibition was a private venture organised by the Frenchman Jules Joubert and the Englishman R.E.N. Twopeny. Temporary buildings were erected in Hagley Park to house the exhibits that had been gathered from various countries. The Exhibition ran for 14 weeks and attracted crowds of 226,000 between April and July 1882. He clearly had the bit in his teeth, because Calcutta was next. The exhibition was a rushed affair and all the exhibits were not in place when it was opened on 4 December 1883. In fact the most famous exhibit at this exhibition, the entry gate, was a few weeks late. This exquisitely carved grey sandstone structure was 16ft high, 12ft high, and weighed 75 tons. The rock came from a quarry at Gwalior, 1000 miles from Calcutta. When the exhibition closed it was sent to the Victoria and Albert museum in London where it was built into the West Hall. Apparently it is no longer visible, having been moved , or covered up, as part of making space for expansion of the Imperial College. Apart from J.B. North’s block of coal, and pieces of torbanite, there were also, in Section F ‘Raw Products’, samples of boghead mineral (torbanite) from Joadja, coal from Bulli and Coal Cliff, and most interestingly, 288 mineral specimens exhibited by S. L. Bensusan of O’Connell Street, Sydney. This is the gentleman given the initials S.L.B in Campbell Mitchell’s diary – which took Karen Carlson a while to figure out when she produced the transcription of that diary as given in Appendix B of The Burning Mists of Time. New Zealand Star newspaper, Issue 4624, 21 Feb 1883. Since we produced The Burning Mists of Time it has become easy to search certain Australian newspapers via the internet – no longer does one have to get squint eyes looking at microfilm in the Mitchell Library, and now one can search for particular names and places. John Shoebridge found, and directed us to, a wonderful article in the Sydney Morning Herald of 13 July 1885 about the opening, and operations, of the Gladstone colliery, and the role of Oscar Schulze in building the Bleichert cableway. This description that, we think, must have relied on technical input from Oscar Schulze, has increased our admiration of him as a brilliant engineer, born before his time. We still don’t understand fully why the Gladstone coal mine came to grief so rapidly. We do know that the coal quality in the Middle River Seam, that was being mined, is not good, but that does not explain what the company ceased to function after only a few thousand tons were removed. We have discovered (Sydney Morning Herald 19 March 1887) that Oscar Schulze took legal action against the directors of the Gladstone Coal Company. The newspaper record is as follows. That is all we have found – but it does seem to indicate that the Gladstone venture was a delusion of grandeur, and they simply ran out of money. The following are extracts from the article. Still another addition, and perhaps one of the most enterprising additions, to the list of New South Wales coal-mining enterprises was formally celebrated on Saturday by the opening if the Gladstone Colliery, Katoomba. The superlative in this case is adopted advisedly, as must be admitted by those who were fortunate enough to secure an invitation to the ceremony of recording the mine’s birthday. “The Gladstone Colliery belongs to the Gladstone Coal Company, Limited who own 450 acres of land almost immediately between the Falls and Katoomba, containing the three seams of coal common to all the Blue Mountains collieries. The centre one of these is 8½ feet thick, and another 4½ feet, neither showing bands or fault of any significance. The land was originally taken up – when probably half a dozen white men had not yet trodden it- by Mr. R. H. Reynolds, of Engehurst, Paddington, about middle of 1883, and a company to work the mineral contained beneath it was floated for £50,000, in £1 shares, during the same year. Prior to deciding upon this, tests had been made which proved the coal to be of excellent and marketable quality. The holding comprises a complete point of country slightly to the west, and in view of the celebrated Wentworth falls. The seam at present being worked (the middle one) has been opened out by two horizontal drives from an adit in a gorge 1½ mile south from the company’s railway siding (which is almost exactly at the sixty-third milepost from Sydney on the Great Western Line), and is 1200 feet below the railway level, or 2000 feet over the level of the sea. It opens out on the side of a hill facing a gorge, and the entrance is at the bottom of a cliff nearly a thousand feet clear in depth, necessitating the use of ladders to reach it, the scaling of which forms excellent gymnastics and nerve-strengthening practice for those unaccustomed to gazing down such giddy heights. “On reaching the ground, an immediate adjournment was made for lunch, which had been prepared for several hundred people in a large marquee, adorned with mountain gigantic ferns, and pitched so as to afford a bird’s eye vista of the timber clearing along which the route to the mine runs…. In deference to those destined after lunch to undertake the stiff mountaineering climb to the mine, toast making was extremely short and practical…. “The bringing into existence of the mine has not been accomplished without enterprise. Second thoughts having been deemed best, the company abandoned their original intention of constructing an incline with endless wire rope down to the mine, owing to the magnitude of the obstructions to be overcome, and the consequent heavy cost. Eventually, on May 13th, 1884, they contracted with Mr. Oscar Schulze C.E., for the construction of one of his patented pendant railways: and later on an order was given to that gentleman for the engines, boiler, rolling-stock, timber work, and foundations. The whole of the material was imported from Germany, the task completed on June 30th, and the first coal delivered the next day, July 1st 1885. Full guarantee was given to the company for the contracted capacity of the plant, which has been fully attained by the delivery of 20 tons of coal per hour. A brief allusion to this novel and evidently audacious invention may not be uninteresting. The delivery of coals by a ‘pendant railway’, referred to in civilian parlance, might be likened to the landing of a wrecked crew in coal buckets along a ship’s cable, albeit the former operation is performed rapidly, quietly, and without a scintilla of risk to life or limb. More practically described, the invention consists of a double track line of steel wire rope rails, one for each track, which are elevated high over the ground, supported on the ends of timbers forming the cap-pieces of wooden trestles, ranging from 12 to 9 feet high, and from 60 to no less than 800 feet apart. These ropes are of a special spiral construction, formed of soft steel, in order to flatten out to a smooth surface after short use. [6A] They are made in fixed lengths connected with steel couplings with right and left hand thread, and vary in diameter from 1½ inch to 1¾ inch. One end is firmly anchored on the timber work, whilst the other is carried over a roller, and fixed hanging weight, which maintains it in a uniform strain of from four to eight tons. The whole extent of the line in question is one and a half mile. It is composed of two sections, the lower half-mile having 1100 feet rise, with a gradient varying from 20 to 45 degrees; the upper half having several up and down gradients, and in one spot overspanning a precipitous timber-clad mountain creek, or gorge, with a free span of 800 feet length and 300 feet high. A steam motor has been fixed at the junction of these two sections (generally known as the ‘stretching station’), and drives two endless wire ropes one inch and 1 ¼ inch diameter, which are completely circulating under the rail ropes, and to which the trucks are attached by patent steel spring couplings, which grip hold of steel collars set on the hauling ropes at distances of about 270 feet. Thus, with a speed of three miles per hour, they deliver one truckload of coal (7cwt) per minute, or about 20 tons per hour. While we had deduced most of the above material, there now follows a description of technology we were not aware of when we wrote the book. “At the railway siding, the pendant platform is elevated 30 feet, and the skips, after passing muster at the hands of a checkweightman, are tilted over the screens into hoppers constructed over the siding, the coal being separated into three sizes (round, small and smallest) during its descent. The automatic principle is so extensively adopted throughout that there is no need for more workmen than two shunters at each station. The motor consists of a ‘Roel’s boiler- a novelty in the colonies – composed of tubes entirely, which contain the water, while the fire is outside the pipes. There is claimed for them simple construction, easy erection, small space, high steam pressure, and perfect absence of danger from explosion. A self-feeding grate is especially constructed for the consumption of small coal, which at many collieries is thrown away as useless. The engines12 are a pair of automatic cut-offs, with double concave and convex slide valves, acted upon immediately by the governors. A steam pressure of 120lb will generate 50 horse-power, sufficient to work the tramway with double the required capacity, but for the present requirements only 30 h.p. are used. A telephone and electric signal bells (especially noteworthy as working without a battery) connect the three stations; and with reference to these may be closed reference to the plant generally” …. 12 The use of the plural indicates two steam engines were used , one for each rope. One may be sized bigger than the other. There is reference to 50 HP in other documents referring to the Katoomba installation. Please refer to the Chapter “Bells and Whistles” for further information on these engines. Further comment from PH on the rope grips. The mention of a haulage rope size of 1¼ inch diameter does not agree with the size of the rope grips on the bucket carriers at Katoomba. 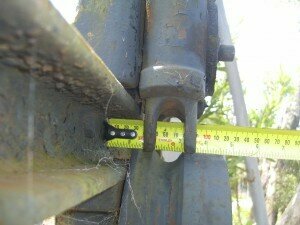 As can be seen in the attached photo the maximum size rope that the grips can accommodate is one inch. It would be possible to have two different sized collars for the two ropes, that had the same outside diameter, then the same rope grips would work with two different ropes, but then the grips would have to take I 1/4″ rope. This is possible, but difficult to believe, because the drives can still be entered, and there is little suggestion that they extended that far into the mountainside. The figure of 11s 3d per ton was actually a high price given that coal from Katoomba colliery could be collected at Katoomba for 5s to 6s per ton, and that, in 1904, AKO&M submitted a tender to the Railway Department at 6s 6d per ton. This is a fascinating comment in a speech – suggesting that Oscar Schulze must have had difficulty in persuading the directors that all his new-fangled ideas would work, and/or that the whole enterprise cost a lot more than they expected. As given on pages 75 and 76 of The Burning Mists of Time, the Bleichert archives record Installation No 195 being ordered by Oscar Schulze and Wagemann in 1884. They also record an earlier order (No 93) in 1880, with a later entry noting ‘Most of the parts of this installation were returned and used for installation No. 195’. In the book we speculated that this earlier order was possibly an earlier order for Gladstone, but this seems unlikely as the Gladstone Coal Company Limited was only established in 1883. We now suspect Order 93 was for some other Oscar Schulze scheme that was too bold for his client! [6A] ( P.H. April 2010 ) This proved to be the eventual undoing of the ropeway, as this idea of producing a flattened wire for smoother running by allowing the bucket carrier wheels to “wear” the rope did not allow for what we now call “metal fatigue” and “work hardening”. These wires were not steel but “crucible iron” which was quite soft. As the wheels flatten the wires, a feather edge is produced on the wire which has tiny cracks, these multiple cracks invade the body of the wire as the rope is bent resulting in eventual failure of the wire. The internal wires were also subject to metal fatigue because of the bending over the saddles upon which the rope rested on the towers. This developed cracks in the internal wires, invisible to any visual inspection from the outside, which also weakened the rope. The failure of the outside wires in the ropes did not go unnoticed however, and two sections of the larger inbound rope were replaced with solid bar, apparantely under the impression that less flexing would be good. They were onto a good idea here, because the single bar was a lot stiffer, and did not flex as much over the towers. Its big disadvantage was that it was 1/3 heavier again than the wire rope it replaced, and this put an unacceptable strain on the main anchor and associated timberwork at the Northern station. As a result the inbound anchor bolt was replaced with an iron bar anchored into the rock, ( Fig. 7-4 ) The discarded anchor bolt and attendant slings and clips was dumped over the bank. In 1974 a washaway, which took out portion of the Scenic Railway track, carried this piece of rope over the cliff and 100 metres down the incline to where it now rests, half buried in rocks and sand. The eventual failure of the ropeway, we think, occured in September of 1889. It was caused by failure of the outside wires of the outbye rope at Tower No. 6, and the already accepted process of replacing it with a piece of bar was underway. A clamp had been placed around the rope, to limit the “run” of the broken wire(s). Modern ropes are preformed, and have the spiral shape forced into them as they are being made. These ropes were not, so when a wire broke, it had a tendency to unwind itself along the rope trying to return to its original straightness. So the clamp in Fig 7-11 was being placed around the rope to hold the wire in place and prevent this from happening. Before the clamp could be tightened around the rope and bolts put in place, the internally cracked wires broke and the rope failed. It is interesting to note, that in order to carry out this procedure, the tensioning turnbuckles in the tension pit, which was ( and is ) situated halfway down the slope towards Cascade Creek, should have been eased to make it easier to work on the rope at the top of the cliff. This sudden reduction in the tension could have caused the wires to crack right through, as the rope tried to return to its “non-bent” state. This equates to 2414 metres which agrees reasonably well with the distance of 2065 meters suggested on p76 of The Burning Mists of Time. This is the crossing of the headwaters of the Valley of Waters Creek – see Figure 7-6 in The Burning Mists of Time. The 800 feet span is about right but the 300 feet high is an exaggeration, more like 150 feet. The precise calculation would give 18¾ tons per hour. By ‘roller’ the journalist must be referring to large sheave wheels at either end. I went to the track crossing where the track ropes cross the Federal Pass. The outbound rope has recently ( late 2010 ) broken, where it was touching the ground, and rust had weakened it. The weight of the downhill length of rope was sufficient to break it. This outbound rope is 25 mm diameter here, not 32 mm as it is closer to the Northern terminus. Just below the track there are two coils of discarded rope, one inbound and one outbound. Both are badly worn and the inbound has a broken wire. I have removed this broken wire for testing and examination of the break. I conclude that these rope lengths were discarded when the 25mm rope was replaced by a solid bar, and asume that the inbound rope was renewed with an unworn length. [ Terminology note: ] The two wheels that run on the track rope are mounted on the Carriage. The Carriage pivots on the Cradle. The Cradle carries the Bucket, on two hooks one on the front arm of the cradle and one on the back arm. To the Cross arm of the cradle is bolted with 4 bolts, the Rope Grip Slide, into which the Rope Grip is inserted, and slides up and down to engage or disengage with the Rope Spider , which is an insert in the rope designed to engage with the Fingers of the Rope Grip. Also just below the track are two cradles.The lowest one has a badly smashed carriage, only the central part of the casting remains, both wheels are missing, also the rope grip slide is broken away at the back end and remains in situ. The foreward arm of the cradle is slightly bent at the hook and the cradle’s upper arms are bent, the rearward one concave and the front one convex. I consider that this cradle was hit from behind by an escaped cradle, the rope spider on this one acting as the “stationary” point, hence breaking away the rear of the slide holding it. A second cradle is above the first, more deeply buried, so all I can see at the moment is that the rope grip has been unbolted, presemably because it was re-usable. Further excavation is necessary. As both these cradles are fitted with “anti-tilt brackets” it seems unlikely that the spider had escaped from the rope grip, especially from a grip holding back an empty bucket, travelling downhill. Is it possible that the spider has come loose on the rope? Once the cradle that has been hit has been freed from the spider, the impact from the runaway cradle will pivot it upwards and allow the cariage to be then hit by the runaway carriage. When we excavate the buried carriage, I expect it to be smashed also, especially on the front. I cannot explain how the front and back of the “hit” carriage are broken. By my calculations, a runaway bucket from a following spider 270 feet behind, on a 30 degree slope would be doing 92 ft/sec or 100 kph at impact.